It’s me, Simon. 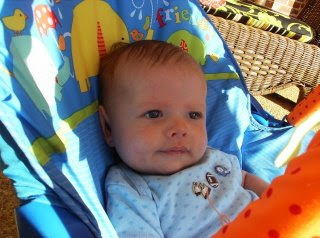 I turned 6 months old last week, and Mommy said it was high time that we updated the blog. Take a look at some of my pictures. 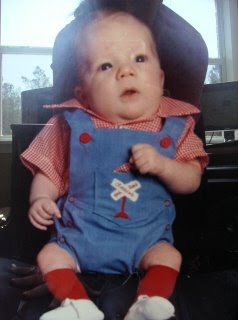 Mommy and Daddy think I’m a pretty cute guy…at least that’s what they tell me a lot anyway. I’m rolling all over the place and can sit up for just a few brief seconds on my own. I like to get on my belly and kick my arms and legs. I LOVE my hands, by the way, and want to reach out and touch everything I see. I don’t have any teeth yet, but I’m working on it. I drool a whole lot and will gnaw on anything I can get into my mouth. Over the past week, I’ve had A LOT of dirty diapers. Mommy was kinda worried at first, but I feel good and haven’t run any fever. The doctor said it was likely associated with teething. I weigh 17lbs. Mommy calls me her little chunky monkey. I’m babbling a lot more lately and have just recently started saying something that sounds very close to ‘Da da’. (You can just imagine Kelly’s delight!) We’ve had a nice summer, but Mommy keeps saying she’s ready for fall and cooler weather. Daddy keeps talking to me about this football and hunting stuff. Maybe I’ll get to give you all another update soon…Mommy said at least before I begin shaving my face and driving a car. ;) Have a good week everybody! Mommies, and Daddies too, I am curious to know at what age you began to introduce your little ones to cereal. (as in a little mixed into their formula/breast milk). I am asking because I have received many different answers. 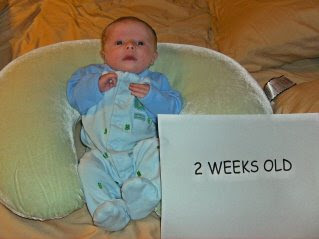 I have heard as early as two weeks from some and then others at four months. People have told me that I would ‘just know’ when Simon was ready. Please comment to share what worked for you and your baby! Things have been busy around the Reynolds household lately…lots of feedings, diaper changes and long rocks in the glider. All is still well. 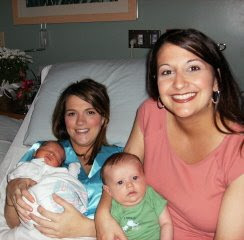 Just to catch up, our best friends, Jason and Jade Gaskin, welcomed Presley Matthew into the world Friday, April 10. He weighed 6 lbs. 15 oz. and was 19 inches. He is absolutely precious! It is funny to see him and Simon together because our little man looks so much bigger next to him. 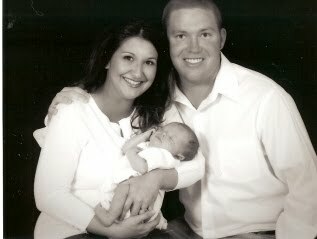 The picture above was taken at the hospital when Presley was just a few days old. So, you can see what I’m talking about! ;) We are looking forward to all of the good times shared with them as friends. Jade and I have joked that we will quite likely be paid back for all of the things we got in to growing up. She and I have been friends since the first grade. I think it is so awesome that we can now share this special time together too. Simon is growing, growing and growing some more!! 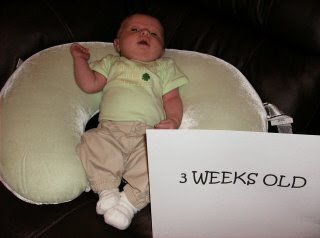 He was nine weeks old yesterday. 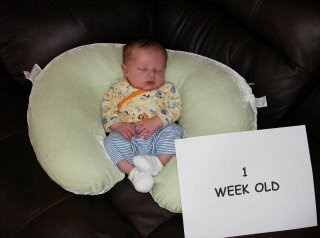 We went to the doctor Friday for his first round of vaccinations. Vaccinations=NOT FUN!! Honestly, I think Mommy here probably took it harder than little Simon did. He had one vaccination by mouth and then three injections. He probably cried for less than a minute but it felt like much longer to me. He was a little fussy later that afternoon but never ran a fever. By Saturday he was back to his sweet self. He now weighs 11 lbs 7 oz and has begun to smile at us. His smiles make my day. He also still wakes twice at night to eat. Sometimes, he only wakes once. I am going to begin working again Monday. While I am sort of ready to get back into a familiar routine, I am certainly going to miss being with him all day. We had a very nice first Easter with Simon. It was also his first time to go to church. Unfortunately, Daddy took the picture you see here of Simon and I so he wasn't in it with us. I didn't take my camera to church but some others had theirs and got a few family pictures. I'll have to post those later once I get them. 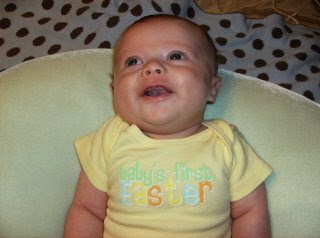 In the other picture, Simon's shirt says "Baby's First Easter". I hope those of you reading this had a wonderful Easter as well! Thankfully, Simon has been patient with his new Mommy and Daddy over the past four weeks. This month has definitely been a learning experience for us. ;) It has also been one of the most special, exciting, emotional and happiest months of my life. On another note, Kelly’s Birthday was March 18th. Simon took him some cookies to work and we also celebrated with a sushi dinner. Yummy! Happy Thursday everyone! Simon loves his baths! As soon as you put him in the water, he gets very still and quiet. Here is a picture we took of his first tub experience! 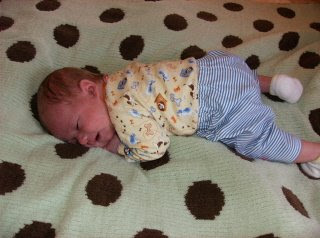 Simon was welcomed into the world Tuesday, February 24 at 9:55pm weighing 7lbs. 0oz. and was 21 inches long. I was induced Tuesday morning at 6:00am but only made it to 3 cm. We learned around 8:30 that night that Simon wouldn’t ‘engage’. So, we topped off the long day with a section and a healthy baby boy! Everyone is doing great. Simon is just perfect. Yes, I know that’s a typical Mommy response-but he really is! 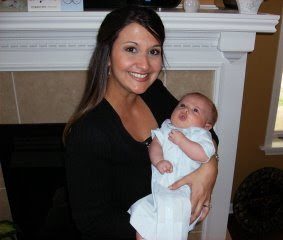 Although many people told me how wonderful this little miracle would be, I don’t think I truly realized just how much love and emotion would be born that night along with Simon. It really was ‘love at first sight’. All Kelly and I want to do is sit and look at him. Speaking of Kelly, he has been WONDERFUL throughout this entire journey and is such a proud Daddy! ;) We have been so blessed. So many times over the past two weeks, when I sit and think about all that has taken place, all I can say is ‘My cup runneth over!’ Thank you Lord! Kelly and I were married in 2003. We have one son, Simon.